In the last year or so there’s been a fair amount of coverage of the excellent Ubertooth project. Ubertooth One is an open source 2.4 GHz experimentation device, designed for messing with bluetooth, but with a lot of flexibility which gives rise some other very cool features, like spectrum monitoring. I installed the Kismet Spectrum-Tools on a Backtrack Linux box to play with, and thought I’d share a brief howto, along with some images. Spectrum-Tools is available via apt, but as is often the case, the available version is too old to have Ubertooth support. To install a pretty useful meta-package containing most build tools you’re likely to need. To build and install the software. On my BT5 system, the final command installed the binaries into /usr/local, which seems to be where most of backtrack’s special software ends up. Now that you have Spectrum-Tools installed, it’s time to play. 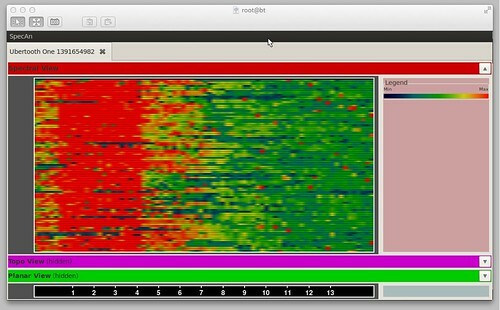 The prettiest thing to play with is spectool_gtk, so plug your Ubertooth in, fire it up, and click Open Device. Next, click Enable, and you should be good to go. 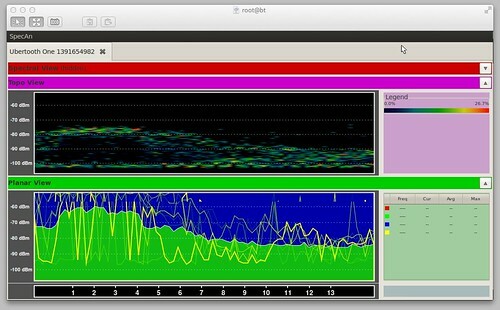 If everything worked, you’ll see a colourful interface, with three horizontal panes, showing three different representations of the spectrum, with WiFi channels at the bottom. Right clicking on these two graphs lets you toggle a few options. If your Planar View, is looks too busy, for example, it can be useful to switch of the current values.